Mexican Feather Grass is a fast growing and small ornamental grass that is a great choice for median plantings, xeriscape landscapes and rock gardens. Due to it’s small size, plants also add beautiful texture to container plantings. Mexican feather grass has a clumping habit so it works very well in mass plantings; however you can also use it in mixed borders combined with natives, roses, perennials and even succulents. The tanish-green panicle flowers begin to form in the summer and last until winter. This grass will seed freely in your landscape so be prepared for plants to spread. While a full sun location is best, plants don’t mind some light shade in the afternoon, especially in warmer climates. Mexican Feather Grass can go dormant or partially dormant during summer months in hot climates, but will reflush in the fall. After the grass goes dormant you can cut it back to the crown for a cleaner look. 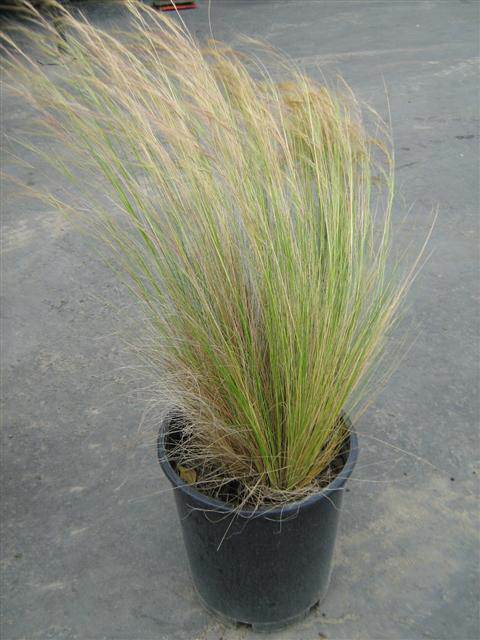 Mexican feather grass needs good drainage and performs best in well-draining soil; even rocky soil. Mexican Feather Grass in not particularly susceptible to many pest or pathogens and is an excellent low-maintenance feature.